This is a list of musical terms that are likely to be encountered in printed scores, music reviews, and program notes. Most of the terms are Italian (see also Italian musical terms used in English), in accordance with the Italian origins of many European musical conventions. Sometimes, the special musical meanings of these phrases differ from the original or current Italian meanings. Most of the other terms are taken from French and German, indicated by "Fr." and "Ger. ", respectively. Unless specified, the terms are Italian or English. The list can never be complete: some terms are common, and others are used only occasionally, and new ones are coined from time to time. Some composers prefer terms from their own language rather than the standard terms listed here. Return to normal tempo after a deviation. Not recommended in string parts, due to possible confusion with battuto (qv. ); use a tempo, which means the same thing. Broken down, crushed; the sounding of the notes of a chord not quite simultaneously, but from bottom to top. Very high; see also in altissimo. At the bridge (i.e. playing a bowed string instrument near its bridge, which produces a heavier, stronger tone). See sul ponticello. A liturgical or other composition consisting of choral responses, sometimes between two choirs; a passage of this nature forming part of another composition; a repeated passage in a psalm or other liturgical piece, similar to a refrain. One or more grace notes that take up some note value of the next full note. like a harp (i.e. the notes of the chords are to be played quickly one after another instead of simultaneously). In music for piano, this is sometimes a solution in playing a wide-ranging chord whose notes cannot be played otherwise. Arpeggios are frequently used as an accompaniment. See also broken chord. (from the Italian Ballabile meaning "danceable") In ballet the term refers to a dance performed by the corps de ballet. The term Grand ballabile is used if nearly all participants (including principal characters) of a particular scene in a full-length work perform a large-scale dance. unit of music containing a number of beats as indicated by a time signature; also the vertical bar enclosing it. A term that instructs string performers to play a pizzicato note to pull the string away from the fingerboard so that it snaps back percussively on the fingerboard. The lowest of the standard four voice ranges (bass, tenor, alto, soprano); the lowest melodic line in a musical composition, often thought of as defining and supporting the harmony; in an orchestral context, the term usually refers to the double bass. Horizontal or diagonal line used to connect multiple consecutive notes. Jazz term referring either to establishing a pitch, sliding down half a step and returning to the original pitch or sliding up half a step from the original note. 1. Transitional passage connecting two sections of a composition, or between two A sections (e.g., in an A/B/A form). 2. Part of a violin family or guitar/lute stringed instrument that holds the strings in place and transmits their vibrations to the resonant body of the instrument. Brilliantly, with sparkle. Play in a showy and spirited style. A chord in which the notes are not all played at once, but in some more or less consistent sequence. They may follow singly one after the other, or two notes may be immediately followed by another two, for example. See also arpeggio, which as an accompaniment pattern may be seen as a kind of broken chord; see Alberti bass. A theme that is repeated and imitated and built upon by other instruments with a time delay, creating a layered effect; see Pachelbel's Canon. In a singing style. In instrumental music, a style of playing that imitates the way the human voice might express the music, with a measured tempo and flexible, legato. Meaning respectively "measured song" or "figured song". Originally used by medieval music theorists, it refers to polyphonic song with exactly measured notes and is used in contrast to cantus planus. A later term for cantus mensuratus or cantus figuratus is cantus musicus ("musical song"). Comfortable (i.e. at moderate speed); also, allegro comodo, tempo comodo, etc. 2. describes the chords, rhythms, and countermelodies that instrumental players used to support a musician's melody and improvised solos. 1. to comp ; action of accompanying. With a mute, or with mutes. Frequently seen in music as (incorrect Italian) con sordino, or con sordini (plural). An adjective applied to a melodic line that moves by step (intervals of a 2nd) rather in disjunct motion (by leap). String. On piano refers to use of the soft pedal which controls whether the hammer strikes one or three strings; see una corda, tre corde below. Symbol at the very end of a staff of music which indicates the pitch for the first note of the next line as a warning of what is to come. The custos was commonly used in handwritten Renaissance and typeset Baroque music. 4), except with the beat lengths doubled. Indicated by . This comes from a literal cut of the symbol of common time. Thus, a quarter note in cut time is only half a beat long, and a measure has only two beats. See also alla breve. From the Latin deesse meaning to be missing; placed after a catalogue abbreviation to indicate that this particular work does not appear in it. The plural, desunt, is used when referring to several works. Two dots placed side by side after a note to indicate that it is to be lengthened by three quarters of its value. A slow, moody, or decreased tempo or played or done in such a tempo. It also refers to a genre of electronic music based on this (downtempo). Effusive; excessive in emotional expression; gushy. Jazz term describing a note of definite pitch sliding downwards to another note of definite pitch. Finished, closed (i.e. a rest or note is to be held for a duration that is at the discretion of the performer or conductor) (sometimes called bird's eye); a fermata at the end of a first or intermediate movement or section is usually moderately prolonged, but the final fermata of a symphony may be prolonged for longer than the note's value, typically twice its printed length or more for dramatic effect. A symbol (♭) that lowers the pitch of a note by a semitone. The term may also be used as an adjective to describe a situation where a singer or musician is performing a note in which the intonation is an eighth or a quarter of a semitone too low. Literally "flight"; hence a complex and highly regimented contrapuntal form in music. A short theme (the subject) is introduced in one voice (or part) alone, then in others, with imitation and characteristic development as the piece progresses. Funeral; often seen as marcia funebre (funeral march), indicating a stately and plodding tempo. A continuous sliding from one pitch to another (a true glissando), or an incidental scale executed while moving from one melodic note to another (an effective glissando). See glissando for further information; and compare portamento. An extra note added as an embellishment and not essential to the harmony or melody. A musical texture with one voice (or melody line) accompanied by subordinate chords; also used as an adjective (homophonic). Compare with polyphony, in which several independent voices or melody lines are performed at the same time. A well-known composition from the jazz repertoire which is widely played and recorded. Jump; a bowing technique in which the player is instructed to let the bow bounce or jump off the strings. A musician who plays any instrument with a keyboard. In Classical music, this may refer to instruments such as the piano, pipe organ, harpsichord, and so on. In a jazz or popular music context, this may refer to instruments such as the piano, electric piano, synthesizer, Hammond organ, and so on. French for lasciare suonare ("let vibrate"). "Let ring", meaning allow the sound to continue, do not damp; used frequently in harp or guitar music, occasionally in piano or percussion. Abbreviated "lasc. suon." A melodic interval greater than a major 2nd, as opposed to a step. Melodies which move by a leap are called "disjunct". Octave leaps are not uncommon in florid vocal music. The same; applied to the manner of articulation, tempo, etc. [in] place (i.e. perform the notes at the pitch written, generally used to cancel an 8va or 8vb direction). In string music, also used to indicate return to normal playing position (see Playing the violin). Piece composed from parts of existing pieces, usually three, played one after another, sometimes overlapping. Half loudly (i.e. moderately loudly). See dynamics. Half softly (i.e. moderately softly). See dynamics. A female singer with a range usually extending from the A below middle C to the F an eleventh above middle C. Mezzo-sopranos generally have a darker vocal tone than sopranos, and their vocal range is between that of a soprano and that of a contralto. Metronome Marking. Formerly "Mälzel Metronome." The act or process of changing from one key (tonic, or tonal center) to another. This may or may not be accompanied by a change in key signature. Rapid alternation of a note with the note immediately below or above it in the scale, sometimes further distinguished as lower mordent and upper mordent. The term "inverted mordent" usually refers to the upper mordent. Change: either a change of instrument (e.g. flute to piccolo, horn in F to horn in B♭); or a change of tuning (e.g. guitar muta 6 in D). Note: does not mean "mute", for which con sordina or con sordino is used. Muta comes from the Italian verb mutare (to change into something). Interval between one musical pitch and another with half or double its frequency. Twelve semitones equals an octave, so does the first and eighth (hence "oct"ave) note in a major or minor scale. The practice of using solo voices on each musical line or part in choral music. In bowed string music, an indication to discontinue extended techniques such as sul ponticello, sul tasto or col legno, and return to normal playing. The same as "naturale". In jazz or rock, a group of three musicians which includes a Hammond organ player and two other instruments, often an electric guitar player and a drummer. An orchestral composition forming the prelude or introduction to an opera, oratorio, etc. Passionately, with great emotion. A related term is Pathetique: A name attributed to certain works with an emotional focus such as Tchaikovsky's 6th symphony. In piano scores, this instructs the player to press the damper pedal to sustain the note or chord being played. The player may be instructed to release the pedal with an asterisk marking (*). 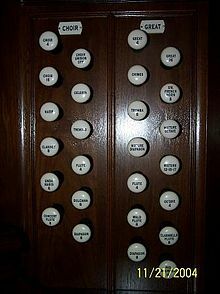 In organ scores, it tells the organist that a section is to be performed on the bass pedalboard with the feet. Literally 'crying' (used in Liszt's La Lugubre Gondola no. 2). very gently (i.e. perform very softly, even softer than piano). This convention can be extended; the more ps that are written, the softer the composer wants the musician to play or sing, thus ppp (pianississimo) would be softer than pp. Dynamics in a piece should be interpreted relative to the other dynamics in the same piece. For example, pp should be executed as softly as possible, but if ppp is found later in the piece, pp should be markedly louder than ppp. More than three ps (ppp) or three fs (fff) are uncommon. A Picardy third, Picardy cadence (ˈpɪkərdi ) or, in French, tierce picarde is a harmonic device used in Western classical music.It refers to the use of a major chord of the tonic at the end of a musical section that is either modal or in a minor key. Full, as, for example, a voce piena = "in full voice"
Jazz term referring to a note that slides to an indefinite pitch chromatically downwards. Half of a semitone; a pitch division not used in most Western music notation, except in some contemporary art music or experimental music. Quarter tones are used in Western popular music forms such as jazz and blues and in a variety of non-Western musical cultures. A recurring passage for orchestra in the first or final movement of a solo concerto or aria (also in works for chorus). A rapid series of ascending or descending musical notes which are closely spaced in pitch forming a scale, arpeggio, or other such pattern. See: Fill (music). Bouncing the bow as in a staccato arpeggio, literally means "jumping"
A light, "joking" or playful musical form, originally and usually in fast triple metre, often replacing the minuet in the later Classical period and the Romantic period, in symphonies, sonatas, string quartets and the like; in the 19th century some scherzi were independent movements for piano, etc. Without repetition: "when a movement, repeated in the first instance, must, on the Da Capo, be played throughout without repetition." Without the mute. See sordina. A jazz term describing a trill between one note and its minor third; or, with brass instruments, between a note and its next overblown harmonic. A symbol (♯) that raises the pitch of the note by a semitone. The term may also be used as an adjective to describe a situation where a singer or musician is performing a note in which the intonation is somewhat too high in pitch. Seventh note of the series ut, re, mi, fa, sol, la, si, in fixed-doh solmization. A symbol in Western musical notation (generally a curved line placed over the notes) indicating that the notes it embraces are to be played without separation (that is, with legato articulation). Alone (i.e. executed by a single instrument or voice). The instruction soli requires more than one player or singer; in a jazz big band this refers to an entire section playing in harmony. In orchestral works, soli refers to a divided string section with only one player to a line. A jazz term that instructs a lead player or rhythm section member to play an improvised solo cadenza for one or two measures (sometimes abbreviated as "break"), without any accompaniment. The solo part is often played in a rhythmically free manner, until the player performs a pickup or lead-in line, at which time the band recommences playing in the original tempo. A piece played as opposed to sung. A mute, Note: sordina, with plural sordine, is strictly correct Italian, but the forms sordino and sordini are much more commonly used as terms in music. Instruments can have their tone muted with wood, rubber, metal, or plastic devices, (for string instruments, mutes are clipped to the bridge; for brass instruments, mutes are inserted in the bell), or parts of the body (guitar; French Horn), or fabric (clarinet; timpani), among other means. In piano music (notably in Beethoven's Moonlight Sonata), senza sordini or senza sordina (or some variant) is sometimes used to mean keep the sustain pedal depressed, since the sustain pedal lifts the dampers off the strings, with the effect that all notes are sustained indefinitely. Making each note brief and detached; the opposite of legato. In musical notation, a small dot under or over the head of the note indicates that it is to be articulated as staccato. Vertical line that is directly connected to the [note] head. Originally truly 'improvised' now taken as 'appearing to be improvised,' an Italian 'folk' song, the style of which used for example by Puccini in certain of his operas. Suddenly (e.g. subito pp, which instructs the player to suddenly drop to pianissimo as an effect); often abbreviated as sub. Literally, "on", as in sul ponticello (on the bridge); sul tasto (on the fingerboard); sul E (on the E string), etc. "on E", indicating a passage is to be played on the E string of a violin. Also seen: sul A, sul D, sul G, sul C, indicating a passage to be played on one of the other strings of a string instrument. Actual sound. Primarily used with notated harmonics where the written pitch is also the sounding pitch. A disturbance or interruption of the regular flow of downbeat rhythm with emphasis on the sub-division or up-beat (e.g. in Ragtime music). On the fingerboard (i.e. in string playing, an indication to bow or to pluck over the fingerboard); playing over the fingerboard produces a duller, less harmonically rich, gentler tone. The opposite of sul ponticello. The middle section of a double aria, commonly found in bel canto era Italian operas, especially those of Rossini, Bellini, Donizetti, and their contemporaries as well in many early operas by Verdi. When present, the tempo di mezzo generally signals a shift in the drama from the slow cantabile of the first part to the cabaletta of the second, and this can take the form of some dramatic announcement or action to which the character(s) react in the cabaletta finale. Shaking. As used in 1) and 2) below, it is notated by a strong diagonal bar (or bars) across the note stem, or a detached bar (or bars) for a set of notes. A rapid, measured or unmeasured alternation between two or more notes, usually more than a whole step apart. In older theory texts this form is sometimes referred to as a "trill-tremolo" (see trill). vibrato: an inaccurate usage, since vibrato is actually a slight undulation in a sustained pitch, rather than a repetition of the pitch, or variation in volume (see vibrato). A rapid, usually unmeasured alternation between two harmonically adjacent notes (e.g. an interval of a semitone or a whole tone). A similar alternation using a wider interval is called a tremolo. Three notes in the place of two, used to subdivide a beat. Multi-note ornament above and below the main note; it may also be inverted. Also called gruppetto. All; all together, usually used in an orchestral or choral score when the orchestra or all of the voices come in at the same time, also seen in Baroque-era music where two instruments share the same copy of music, after one instrument has broken off to play a more advanced form: they both play together again at the point marked tutti. See also ripieno. One string (i.e. in piano music, depress the soft pedal, altering, and reducing the volume of, the sound). For most notes in modern pianos, this results in the hammer striking two strings rather than three. Its counterpart, tre corde (three strings), is the opposite: the soft pedal is to be released. In unison (i.e. several players in a group are to play exactly the same notes within their written part, as opposed to splitting simultaneous notes among themselves). Often used to mark the return from divisi. A fast, lively, or increased tempo or played or done in such a tempo. It is also used as an umbrella term for a quick-paced electronic music style. First note of the series ut, re, mi, fa, sol, la, si, in fixed-do solmization. Improvised accompaniment, usually a repeating pattern played before next musical passage. See vamp till cue. See comp and comping. Vibrating (i.e. a more or less rapidly repeated slight variation in the pitch of a note, used as a means of expression). Often confused with tremolo, which refers either to a similar variation in the volume of a note, or to rapid repetition of a single note. Turn suddenly (i.e. turn the page quickly). While this indication is sometimes added by printers, it is more commonly indicated by orchestral members in pencil as a reminder to quickly turn to the next page. ^ a b c d e Collins Music Encyclopedia, 1959. ^ "Italian Musical Terms". www.musictheory.org.uk. Retrieved 2016-12-02. ^ Sussman, Richard; Abene, Mike (2012). "Muted Brass". Jazz Composition and Arranging in the Digital Age. Oxford University Press. p. 156. ISBN 978-0-19-538099-6. ^ The modern usage is L'istesso. See measures 4 and 103 of Star Wars: Main Title, in Williams, John (1997). Star wars: Suite for Orchestra. Milwaukee: Hal Leonard Corp. ISBN 978-0-7935-8208-2. ^ Cole, Richard; Schwartz, Ed. "M.M." Virginia Tech Multimedia Music Dictionary. Archived from the original on April 1, 2013. ^ musicdictionary; Merriam-Webster Online Dictionary; American Heritage Dictionary, 4th edition; Gardner Read, Music Notation, 2nd edition, p. 282. ^ Dolmetsch Online, "Tempo"; Oxford American Dictionary; Collins English Dictionary. ^ Hummel, quoted in Rudolf, Max (2001). A Musical Life: Writings and Letters, p.125. Pendragon. ISBN 9781576470381. ^ "uptempo". Oxford English Dictionary. Retrieved 2018-09-14. ^ George Grove, ed. (1900). "vagans" . A Dictionary of Music and Musicians. London: Macmillan. p. 212. Cole, Richard; Schwartz, Ed (October 22, 2012). "Virginia Tech Multimedia Music Dictionary". Virginia Tech Department of Music. Archived from the original on July 15, 2014. This page was last edited on 29 March 2019, at 10:09 (UTC).